Claire & Noble: What do you think? Do es Claire look kind of like a troll? Mike and I think that Claire's hair makes her look like "those ugly troll dolls". Mike told me that by saying that I called Claire ugly. I am stating for the record that I do not think that Claire is ugly. The resemblance is in the hair, not the facial features. 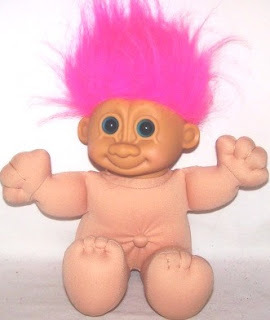 I can't wait to dress Claire up like a troll and spray paint her hair pink. Is that going to be her Halloween costume? She may be a troll, but she's OUR troll, and the cutest one I've ever seen!